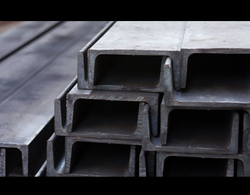 We are engaged in offering our prestigious clients a very highly premium quality range of Industrial Steel Channels. Our Steel Channels range is known for its excellent quality, robust range and durable in nature. Our range is available at market most leading price. We are leading wholesaler and trader of Steel Channels for Heavy Machine Industries. Looking for Heavy Machinery Steel Channels ?